What sets us apart from all the others is we are owned and operated by veterinarians. We stress health and safety for all our boarders and daycare participants; safety to try to avoid injury and prevent transmission of disease. Veterinary personnel will be present to supervise all the cleaning and disinfecting. Only veterinary trained staff will be working or playing with your pets. Let us be your partner in assuring that your pet stays happy and healthy. Veterinary clients of Goldenvale will also receive an additional 5% off all Kennel fees as a thank you for your loyalty! 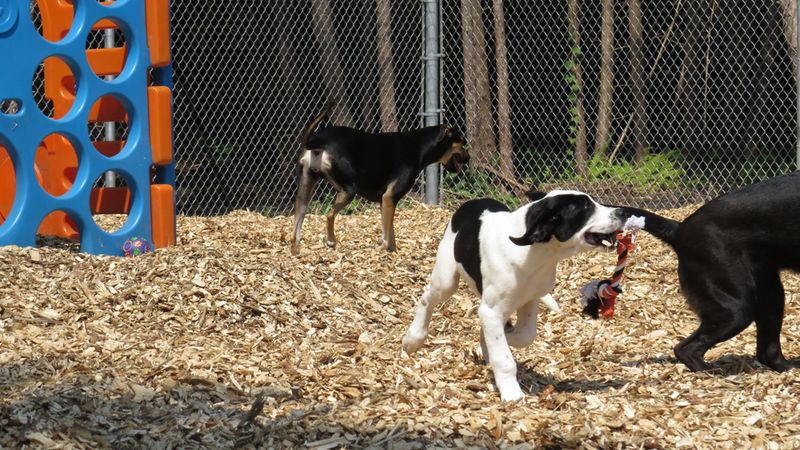 While you’re at work, let your fur-kids come stay with us where they will have play time with similarly sized dogs. Veterinary personnel will supervise all interactions. 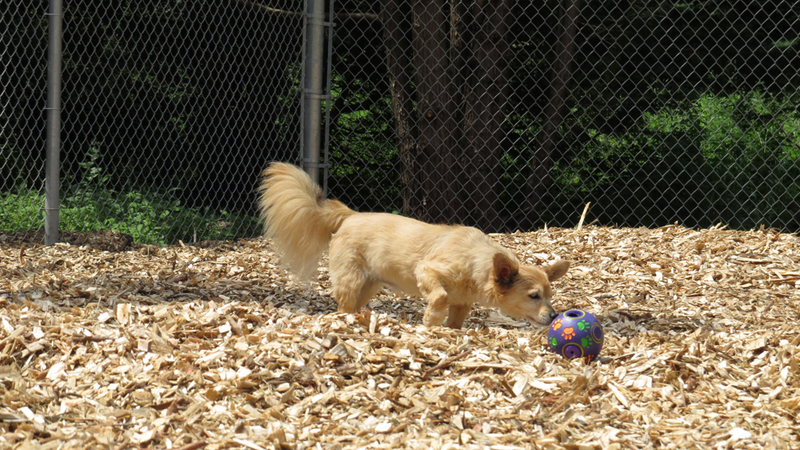 Dogs will also have their own indoor runs to come in for a rest when they need quiet time or for feeding. All dogs participating in group play time will be evaluated for good behaviour. You should bring your dog’s own food if they are on a special diet and require a mid-day meal. We expect that dogs coming to daycare will have breakfast and dinner at home. We serve a premium veterinary diet at no additional charge. If your dog is on medication, please indicate clearly the dosing schedule and dose. Additional charges will be applied for administration of medications. Our daycare hours are 7am to 7pm Monday to Friday. All dogs must be picked up by 7pm or late fees of $1/minute will apply. If a dog is not picked up by 7:30pm, an overnight charge of $20 will be applied and your pet will be transferred to our boarding facility for overnight. 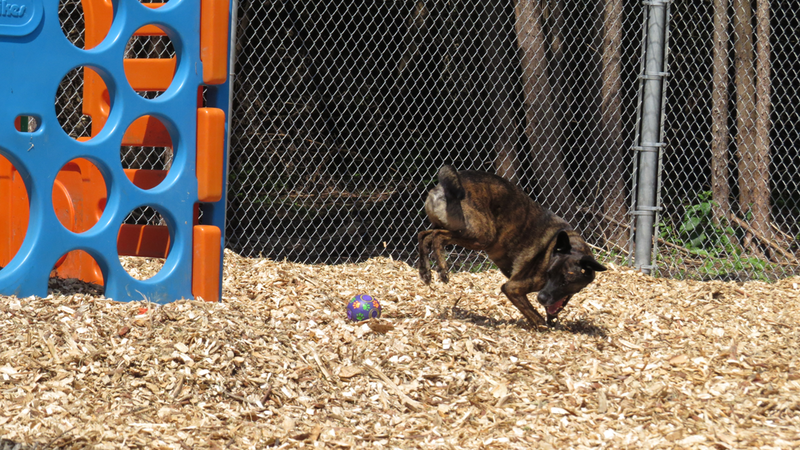 Dogs will have access to their own indoor/outdoor runs. Each run is outfitted with a thick, comfy bed for night time. Cats stay in their own rooms to minimize any stress they may have about seeing dogs. Again, each kennel will have a bed your feline friend can curl up in. You can choose to bring your pet’s regular diet for us to feed them or they can eat our high quality veterinary diet. Please call for boarding pricing. 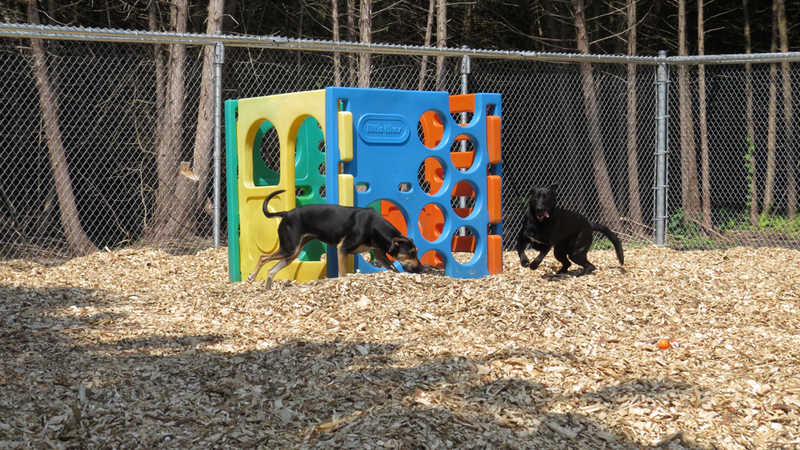 Boarders have the option of joining Doggie Daycare, or staying in their own private suites. Goldenvale feeds Hill’s Science Diet Advanced Fitness at no extra charge during their stay. Fees are on a 24 hour basis. There are no part days for boarding pets. Pick up and drop off times are limited to our Kennel Hours. Reception is not open for pick up/drop off on Sundays or Holidays, but staff is still present to care for the dogs staying with us. The following optional services are also available to all of our Daycare and Overnight Boarding clients for an additional charge, taking advantage of our large and forested property. Dogs can take advantage of our beautiful 14 acres of property! For an additional charge, dogs can be taken for 20 minute walks through the woods, along streams and fields. We welcome our clients to take advantage of the large pond in the front of our clinic. If desired, during your dog’s stay you can sign them up for swim time! Not only is it great exercise but it’s also great mental stimulation for our “water dogs”. Whether they enjoy jumping off our dock, fetching toys, or just paddling along the perimeter, they will surely enjoy their activity time. An additional evaluation is required for our water activity participants since the pond is not a fenced area. Dogs will be evaluated for obedience to ensure their own safety in the open area. If playing all day isn’t for your pet, we offer time alone in our family room with a staff member for cuddles and relaxation. Filled with plush leather furniture, large windows for the sun to come in, a fireplace and even heated floors; we hope this room reminds your pet of the comforts of home.